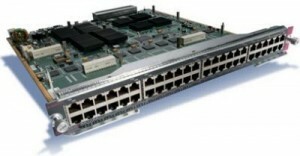 Cisco announces the end-of-sale and end-of life dates for the Cisco Catalyst 6500 Series 48-Port 100BASE-X Ethernet Interface. The last day to order the affected product(s) is July 31, 2013.
trong>Customers with active service contracts will continue to receive support from the Cisco Technical Assistance Center (TAC) as shown in Table 1 of the EoL bulletin. Table 1 describes the end-of-life milestones, definitions, and dates for the affected product(s). Table 2 lists the product part numbers affected by this announcement. For customers with active and paid service and support contracts, support will be available until the termination date of the contract, even if this date exceeds the Last Date of Support shown in Table 1. NOTE: Service prices for Cisco products are subject to change after the product End of Sale date.